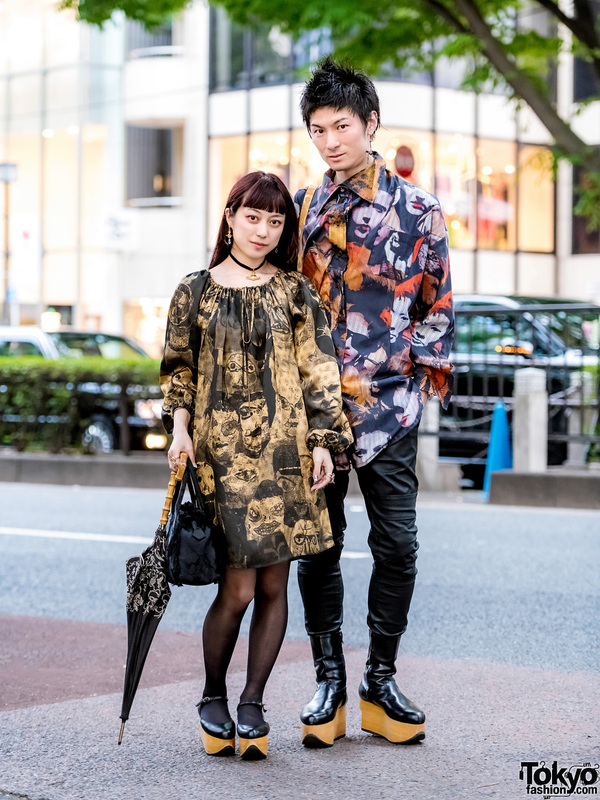 Here are Saki and Kazuki, who turned heads in their eye-catching printed ensembles while on a casual day out in Harajuku. This stylish duo has often been featured on this site due to their striking head-to-toe Vivienne Westwood looks. 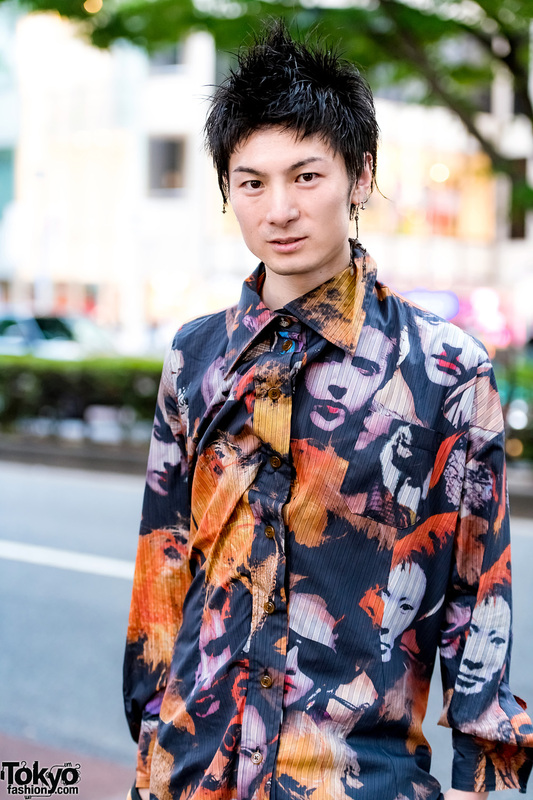 On the right is 33-year-old Kazuki in a Vivienne Westwood collared top, which had long sleeves, a wide front button placket, and an all-over graphic print featuring multiple faces. 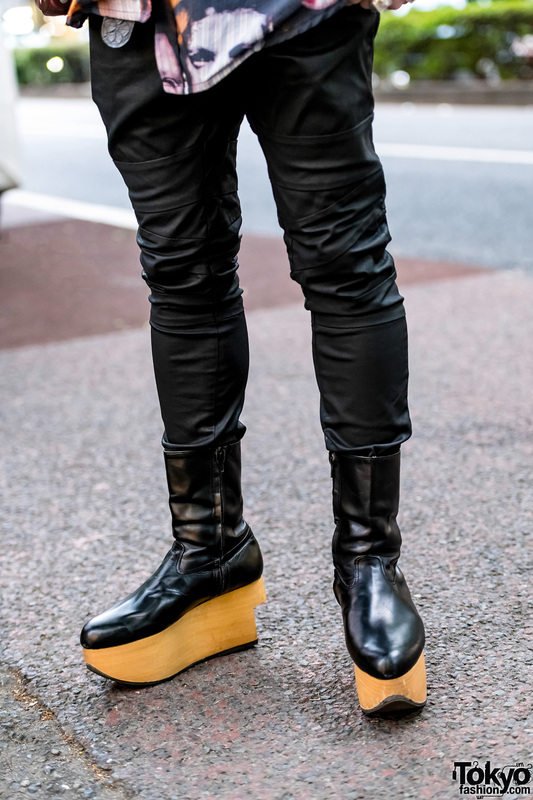 Kazuki wore them with Vivienne Westwood black leather pants tucked into Vivienne Westwood black leather rocking horse shoes with side zip closures and wooden platforms. 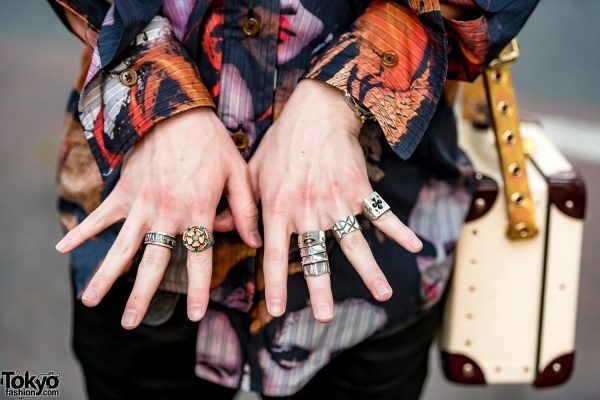 He completed his look with Vivienne Westwood accessories, which include a shoulder bag and chunky silver rings. Kazuki gets his fashion favorites from Vivienne Westwood and World’s End. Follow him on Instagram for his social media updates. Meanwhile, Saki stepped out in a Vivienne Westwood puppet dress with a ruched neckline, drawstring ties, long sleeves, and striking graphic print. The 27-year-old seamstress styled it with black stockings and Vivienne Westwood black leather rocking horse shoes with buckled ankle straps and wooden platforms. 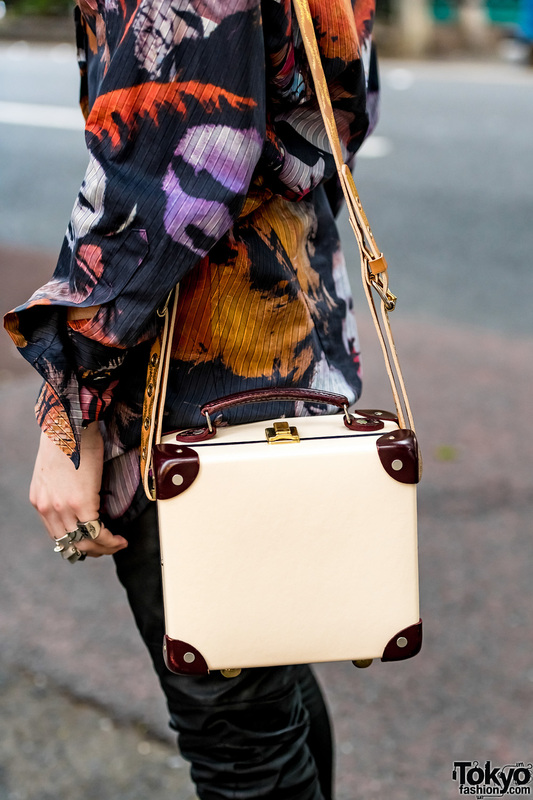 Saki carried a Vivienne Westwood black floral handbag and a black printed umbrella with a wooden handle. She finished off her look with monochromatic nail art and Vivienne Westwood accessories such as dangling earrings, a black choker with a gold pendant, and several chunky rings. Saki names Vivienne Westwood as her favorite fashion brand, and she regularly posts style updates on her Instagram account.